Last week, a professional athlete whom the public at large might otherwise never have looked twice at mounted a quiet, morally forceful act of protest, and in doing so set the worlds of sports and politics ablaze. 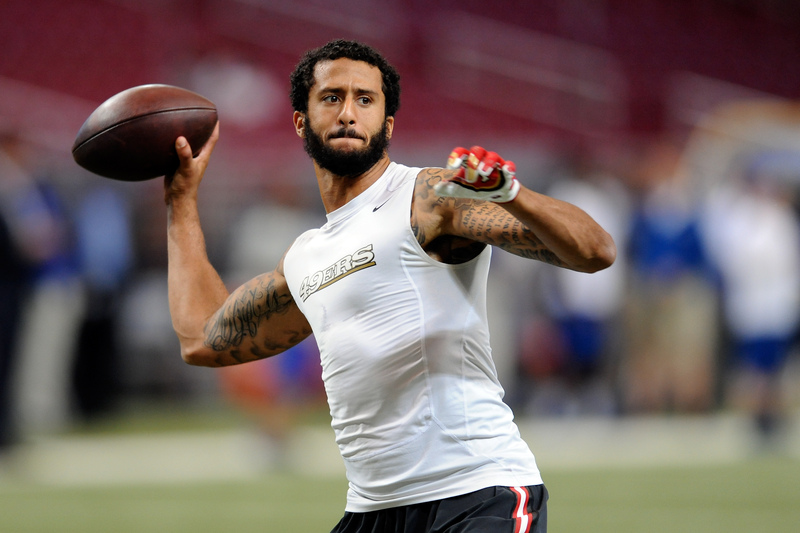 I’m talking about San Francisco 49ers quarterback Colin Kaepernick, whose refusal to stand for the national anthem sparked both outrage and praise. For example, #VeteransForKaepernick trended on Twitter on Tuesday, showing the world the other side of the military view on the activist athlete. Make no mistake, plenty of people haven’t just been questioning Kaepernick’s personal patriotism over his refusal to stand for the anthem; they’ve accused him of dishonoring and demeaning America’s veterans, too. This isn’t backed up by Kaepernick’s extremely straightforward, unvarnished explanation of why he did what he did ― that he wouldn’t stand for the flag of a country that “oppresses black people and people of color,” citing specifically the lack of accountability for police officers who kill people in the line of duty. But after days of strident criticism ― some from people who served in the military, and more from an overwhelming amount of offended civilians ― droves of military veterans turned out on Twitter to support Kaepernick and his right to protest on Tuesday, and it's still going on. It's been interesting to see the reaction that some of Kaepernick's haters on social media have had to the hashtag. So much of the criticism directed at him has been inextricably wrapped up in the notion of respect and admiration for the military, focused on honoring those who serve regardless of any personal political belief. Needless to say, a surge of veterans actually coming out in support of Kaepernick, with some pointing out that he's exercising the freedoms they fought to protect, scrambles and confounds the conventional wisdom of many of his loudest critics. The support has been striking. It probably shouldn't be much of a surprise that Kaepernick is drawing so much support from black veterans, given the cause he's championing. It's easier for white Americans to overlook some of these issues, because, simply put, police brutality and racial injustice impact black Americans to a profoundly different extent. That's not to say that white veterans aren't stepping up too, however ― Kaepernick has drawn support across the lines of race and gender. It'll be fascinating to see what the next stage in this story is — in particular, whether Kaepernick will stick with the 49ers heading into the regular season, or if he'll be cut by the team and be forced to seek new environs. The fact that his high-profile statement could end up hurting him is a big part of why it was such a selfless act to begin with ― as Mike Freeman detailed for Bleacher Report, perhaps the most vitriolic reactions to Kaepernick came not from his fellow players, but from NFL team executives — the ones who do the hiring and firing.